The Mila Dress is perfect black dress for any occasion. This simple, short sleeved shift dress can be dressed up or down with the change of a shoe or accessory. 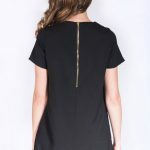 The gold exposed zipper up the back adds a touch of elegance. This dress is perfect for warm days in the office and hot nights out on the town.